Today I’m excited to share my latest wedding photo album! Elizabeth + David were married last fall at the gorgeous Como Conservatory Sunken Garden. Be sure to take a look at their beautiful wedding photos too. 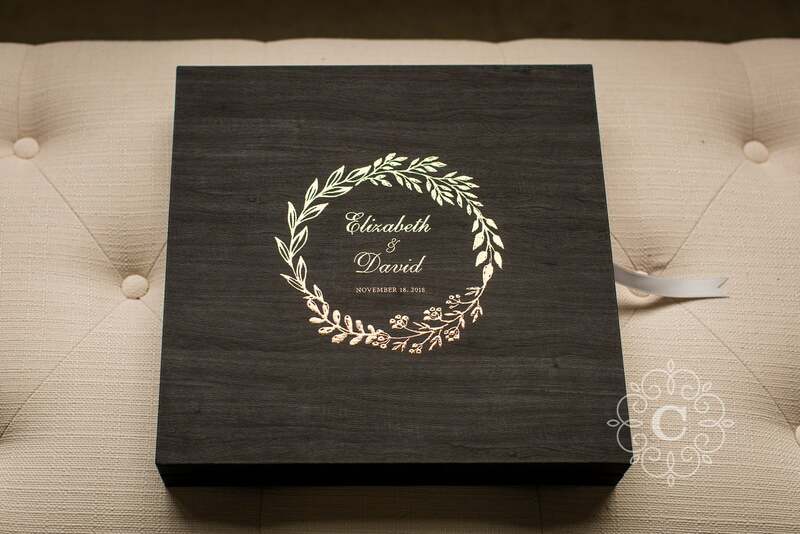 After the wedding, David + Elizabeth wanted a custom Graphistudio wedding album. These gorgeous albums are handmade in Italy. 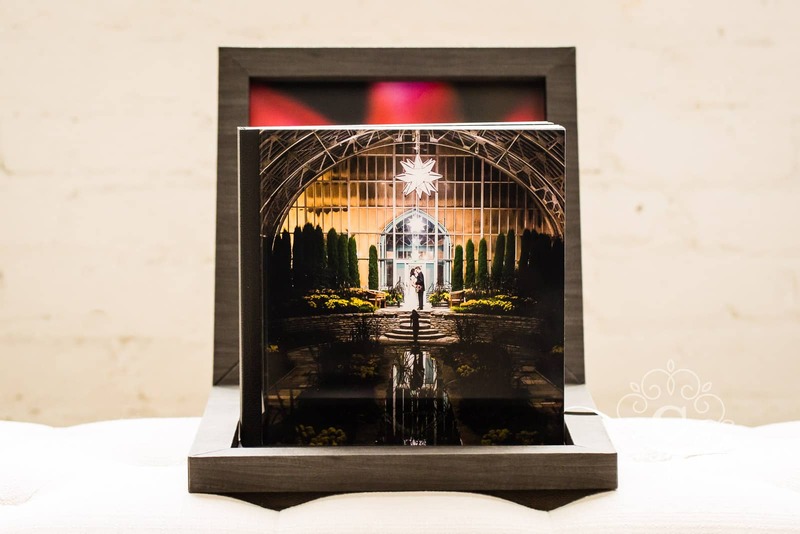 Together, we designed a wedding photo album that perfectly reflected their day. We started with their album box. They chose a dark anthracite gray, wood-patterned Maple material. 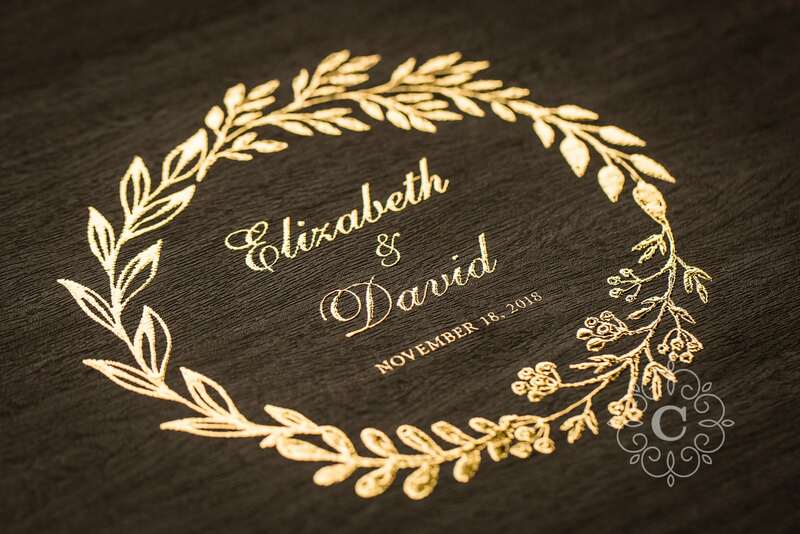 Their names and date were foiled on the top, surrounded by a graphic circle of plants, in elegant gold. 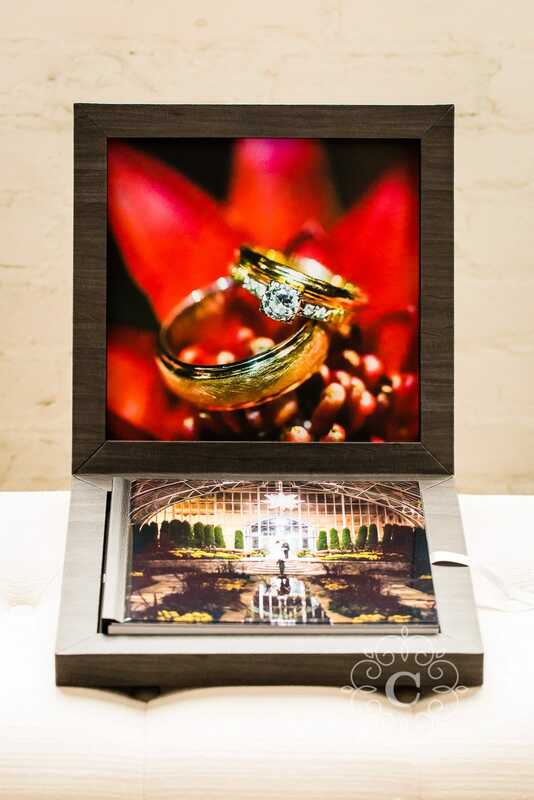 Inside, the box features a photo of their wedding rings on a gorgeous Conservatory bromeliad flower. The box was finished with a crisp white satin ribbon. 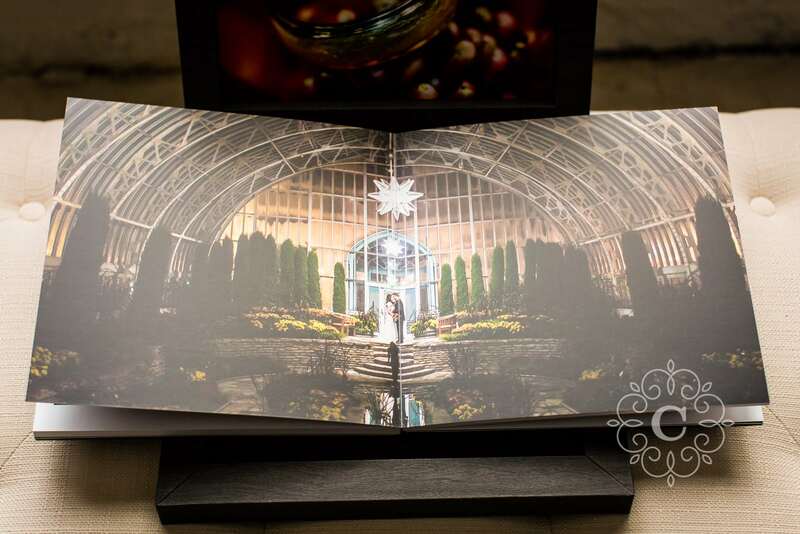 The album features a gorgeous crystal-clear cover with a photo of Elizabeth + David in the spectacular evening light, stone, greenery and flowers of the Sunken Garden. The album is bound with elegant, classic black Italian leather. The pages are printed on metallic professional photo paper and bound into a patented lay-flat binding system. The pages are then finished with a satin coating to protect against fingerprints, dirt and oils. Elizabeth + David loved their album! It is such a wonderful heirloom for them to share with family and friends. They can enjoy it time and again over the years, and pass it down for generations. Congratulations, David + Elizabeth. I loved working with the two of you as your Minneapolis wedding photographer, and I wish you the best in your lives together! I’ve got these and other wedding photo album samples to view. I’d love to meet you at my Minneapolis wedding photography studio to show you them to you. Contact me soon!